Pt.1 of The London Intl Ska Fest Winter Special TONIGHT! 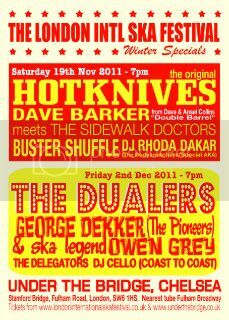 At last part 1 of The London International Ska Festival Winter Special is here… TONIGHT Sat 19 Nov at Chelsea Football Club’s superb Under the Bridge venue: Live- The original hotknives, Dave ‘Double Barrel’ Barker (from DAve & Ansel Collins), The Sidewalk Doctors, Buster Shuffle & Rhoda Dakar DJing (from The Bodysnatchers/ The Specials/Special AKA). Tickets are available on the door. 7pm-1am.